UMP | University of Minnesota Press Blog: For military families, the battle for inner peace during deployment is hard-fought. For military families, the battle for inner peace during deployment is hard-fought. 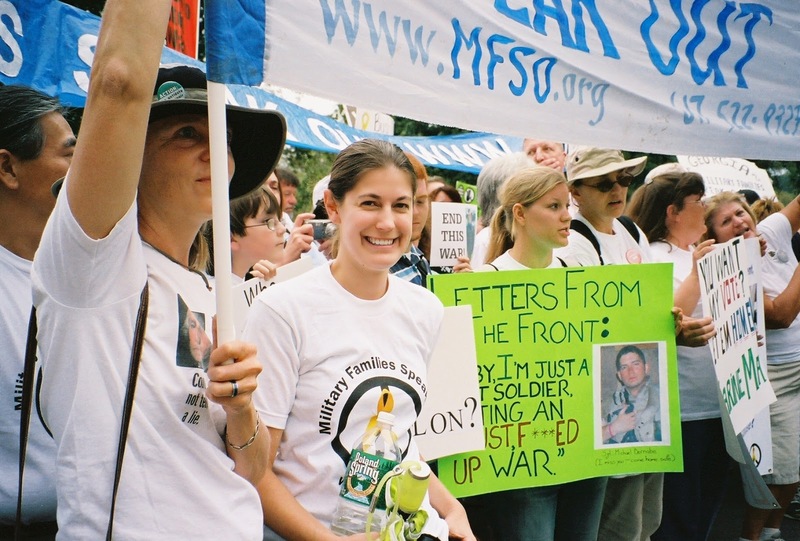 Lisa Leitz was one of approximately 300 members of Military Families Speak Out in attendance at a September 24, 2005, protest in Washington, D.C., organized by United for Peace and Justice and ANSWER. The groups estimate that up to 500,000 protesters were in attendance. However, the deployment still took a toll on us, as it often takes on many military families. With each deployment I found that my own mental health struggles intensified, and the limited providers available to me via military healthcare only exacerbated the anxiety and depression I faced. Although it is popular for people in the U.S. to say they support the troops, this does not translate into a vast number of medical providers who accept the low-paying military health insurance. I was an early adopter of a smartphone because I’d swing from grumpy to cheery when I would get the email from the ship David sent telling me he was safe each day. During all deployments, my cell phone was glued to my hand; I took it into bathroom stalls, slept with it by my head, placed it on the gym machines I’d use, and carried it into classrooms with me. During the most recent deployment, I could logically understand that David was probably safe, but when I heard of violent protests in the city he was in or Navy accidents in the region, my brain activity seemed to slow as I waited to hear from him or for the dreaded knock on the door by men in dress uniform that, I am grateful to say, never came. Physically, the deployments took their toll, during each I gained significant weight, grayed more, took worse care of myself, and saw the worry lines deepen. After each, I struggled to reduce the high levels of worry and loneliness I felt. While many people think of post-traumatic stress as a military servicemember’s problem, recent research finds that military spouses’ rates of psychological problems are similar to those in uniform. With lengthy and deadly deployments common in our lives since 2001, spouses’ rates of stress-induced illness have increased, along with depression. I can rationally know that I am not alone; I have known of other spouses whose war-induced-stress caused them to, in their words, “have a breakdown.” However, the picture often presented of military spouses is that of an ever-cheerful wife, fully ready to handle whatever war throws at her, typically with a smile and a willingness to work many unpaid hours to bring happiness to those in the uniform. It has often felt like failure to admit to struggling with the deployments, and that is probably why there are a growing number of military family members whose suicides seem to be war-related. The problems extend well beyond me to many other spouses and partners, and also to military children, parents, and siblings. The toll of deployments on families must be made visible. Speaking to the Sacramento Bee in 2011, military mom Laurie Loving explained: “It took me 13 months to get my blood pressure down, I gained 40 pounds and went on disability retirement.” Loving’s son had deployed during 2005 and 2006, one of the most dangerous times in Iraq, and she co-founded the California Capital Region chapter of Military Families Speak Out. For family members like Laurie and I, who believed that the Iraq War was illegal and/or immoral, there was no solace in sacrificing for the nation. I have suspicions [ii] that belief in the mission of a war and confidence in military leadership can diminish the likelihood of military servicemembers or their family members developing psychological trauma from deployments. It is logical that disagreement with the necessity of the deployment, with its potential for life, limb or mental health loss, would amplify the negative emotional consequences of war. While life for most Americans continues unhindered by the foreign policy decisions of our government, for less than 5% of this country, troop movements dictate life. The United States currently has active duty military members stationed in nearly 150 countries, with more than 100,000 still in designated combat zones. The intense OPTEMPO [iii] since 9/11 has only recently started to slow some, but most Americans continue to have the luxury of ignoring the wars and their consequences. Fighting for Peace intentionally draws attention to the feelings of grief and betrayal felt by many in the military during this time of disconnect between soldiers and civilians. In expanding on my own story in this post, I hope I can help more civilians understand what deployment is like for those of us left at home. 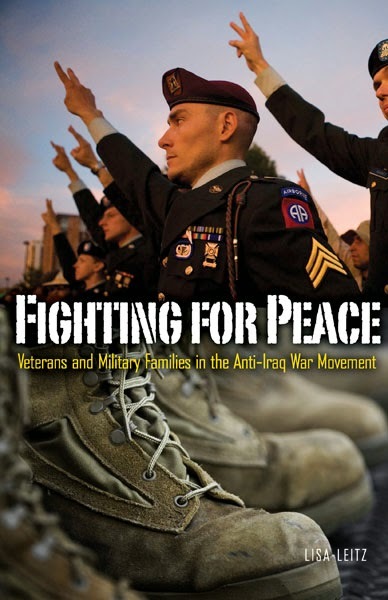 Lisa Leitz is author of Fighting for Peace: Veterans and Military Families in the Anti-Iraq War Movement. She is assistant professor of sociology and director of Project Pericles at Hendrix College in Conway, Arkansas. She is married to a U.S. naval aviator who flew missions in Iraq and Afghanistan, and she was a speaker on the Iraq War and military issues for the 2004 Kerry–Edwards presidential campaign. [i] Individual augmentation (or IA) refers to the military practice whereby members of the military are sent to work in a unit in which they have not previously interacted. This is typically used to fill shortages or because a specific set of skills are needed in a new situation. [ii] No study I am aware of has examined this issue. [iii] Operational tempo, which in this case specifically refers to the pace and length of deployments.